1. Transcriptional networks controlling the establishment and maintenance of white (energy-storing) and brown/beige (energy-burning) adipose tissue. Mammals possess distinct classes of adipocytes, or “fat cells.” White adipocytes are the main site for energy storage in mammals. 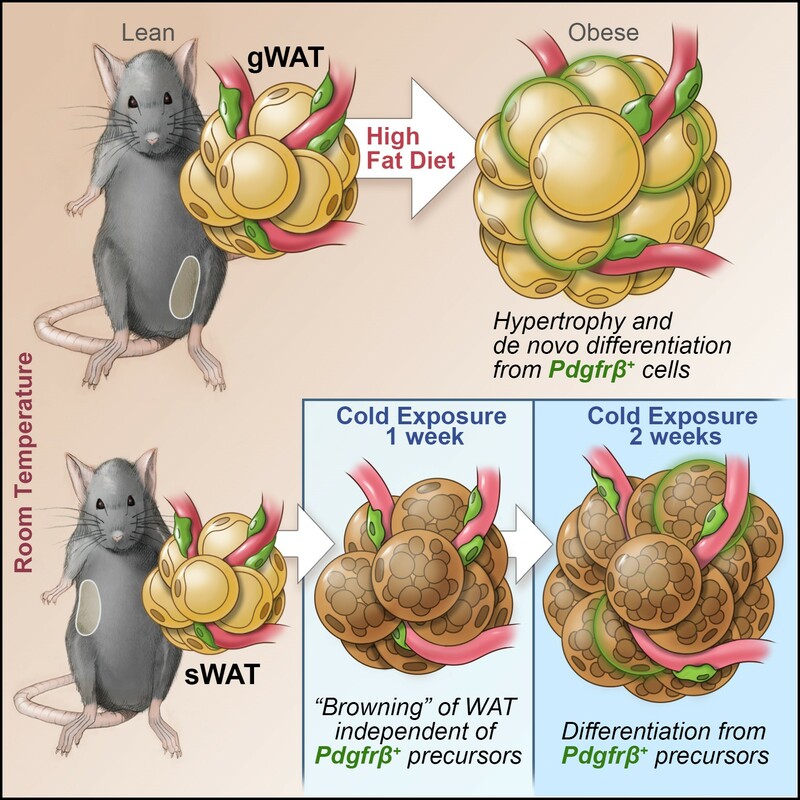 Brown and beige fat cells are specialized to dissipate chemical energy in the form of heat, and likely evolved to protect mammals from hypothermia. Ongoing efforts are focused on 1) identifying the stem/precursor cells that give rise to these various adipocytes and 2) elucidating the transcriptional mechanisms that establish and maintain these distinct adipose lineages. We have identified an important role for the C2H2 zinc-finger transcription factor, ZFP423, in establishing and maintaining the white adipocyte lineage. ZFP423 regulates commitment of adipocyte precursor cells, or “preadipocytes” to the adipocyte lineage through activation of Pparg, the “master regulator” of adipocyte differentiation. Furthermore, we have revealed a critical role for ZFP423 in maintaining the cellular identity of white adipocytes through suppression of the thermogenic brown/beige adipocyte gene program. 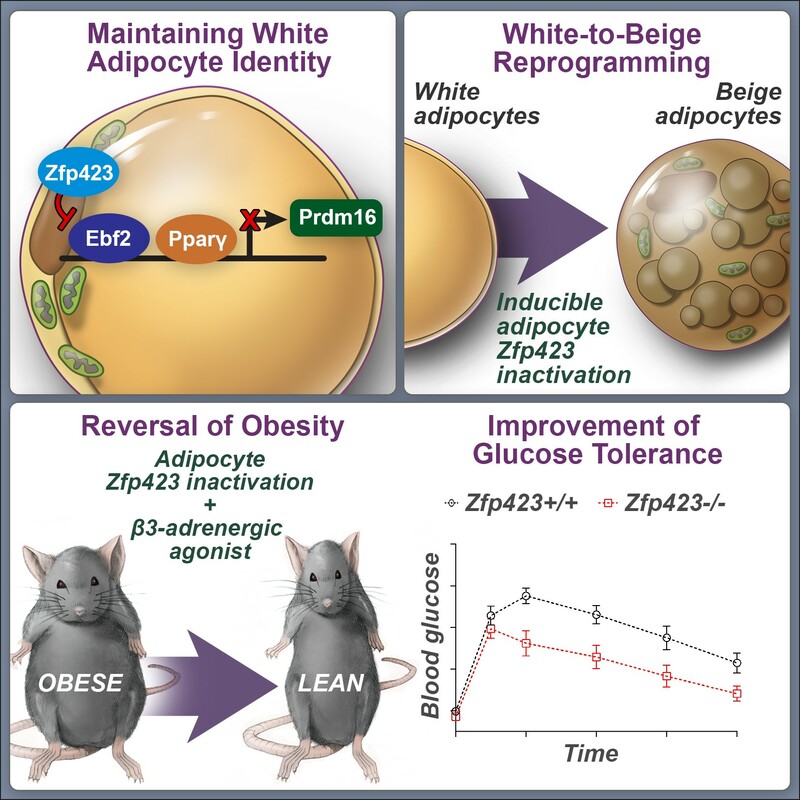 Genetic inactivation of Zfp423 in mature white adipocytes of adult mice leads to a widespread white-to-beige lineage reprogramming, and protection against the development of obesity and metabolic disease. Ongoing efforts are focused on identifying pathways that regulate Zfp423 gene expression in the adipose lineage, as well as critical interacting partners and downstream effectors that mediate its function. 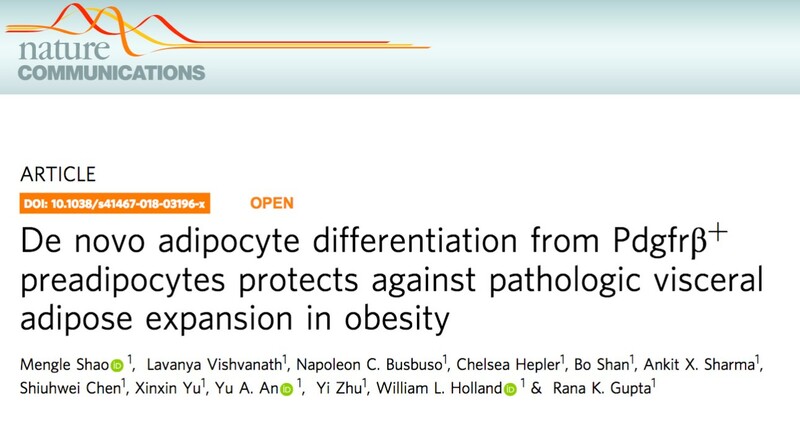 Understanding the mechanisms that control Zfp423 expression and ZFP423 activity in white adipocytes may lead to novel therapeutic strategies to combat obesity and metabolic disease. 2. Contribution of perivascular (mural) cells to adipose tissue remodeling in obesity. The manner by which adipose tissue expands, or “remodels”, is a critical determinant of metabolic health in obesity. 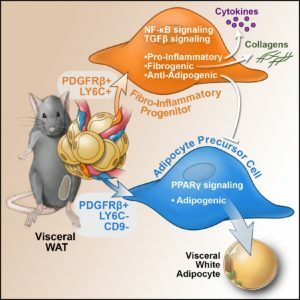 Pathological adipose tissue expansion is characterized by enlarged adipocytes, a failure to recruit new adipocytes (adipogenesis), hypoxia, fibrosis, and pro-inflammatory macrophage infiltration. Healthy adipose tissue expansion (observed in the “Metabolically-Healthy” obese) involves recruitment of new adipocytes from resident precursors and lower levels of inflammation. This limits the burden on individual fat cells and prevents the acquisition of insulin resistance. We have determined that visceral white adipocytes emerging in association with high-fat diet feeding of mice arise from resident PDGFRb+ perivascular (mural) progenitor cells. The highly adipogenic subpopulation of these cells can be identified on the basis of Zfp423 expression. The ability of these precursors to undergo de novo adipogenesis in the setting of diet-induced obesity is critical for healthy visceral adipose tissue remodeling. Recently, we performed single cell sequencing of murine visceral adipose tissue PDGFRb+ cells. Distinct PDGFRb+ subpopulations are identified, including highly committed adipocyte precursors as well as anti-adipogenic, fibro-inflammatory progenitors. These data highlight the functional heterogeneity of adipose stroma and provide insight into potential cellular interactions impacting adipose remodeling in obesity. Ongoing efforts in the lab are focused on identifying the signals that activate these distinct perivascular progenitor subpopulations in obesity and elucidating the array of functions that mural cells have on adipose tissue remodeling, energy balance, and nutrient homeostasis. Understanding the biology of adipose precursors will provide tremendous insight into the developmental origin of fat tissue and physiological regulation of adipose tissue distribution. The ultimate goal of our research is to use our understanding of adipocyte development to generate novel therapeutic strategies for the treatment of obesity and metabolic disease. Fat tissue, also known as white adipose tissue, specializes in storing excess calories. Much of this storage happens under the skin, but fat tissue can also build up inside the abdomen and surround organs, where it is known as ‘visceral’ fat. When visceral fat tissue is unhealthy, it may help diseases such as diabetes and heart disease to develop. Unhealthy fat tissue contains enlarged fat cells, which may die from overwork. The stress this places on the surrounding tissue activates the immune system, causing inflammation and the build-up of collagen fibers around the cells (a condition known as fibrosis). Not all people develop this type of unhealthy fat tissue, but we do not yet understand why. In many tissues, blood vessels serve as a home for several types of adult stem cells that help to rejuvenate the tissue following damage. To identify these cells, Hepler et al. analyzed the genes used by more than 3,000 cells living around the blood vessels in the visceral fat of adult mice. Recent work had already revealed that stem cells called adipocyte precursor cells live in this region. Hepler et al. now reveal the presence of a second group of cells, termed fibro-inflammatory progenitor cells (or FIPs for short). To investigate the roles of each cell type in more detail, Hepler et al. developed a new technique to isolate the adipocyte precursor cells from other cell types. When grown in the right conditions in petri dishes, the adipocyte precursor cells were able to form new fat cells. They could also make new fat cells when transplanted into mice that lacked fat tissue. By contrast, the FIPs can suppress the activity of adipocyte precursor cells and activate immune cells. They may also help fibrosis to develop. It is not yet clear whether FIPs are present in human fat tissue. But, if they are, understanding them in greater detail may suggest new ways to treat diabetes and heart disease in obese people.